SCVHistory.com TLP2301 | Tataviam Culture | Birth Certificate: Caroline Francis Garcia, 1923. 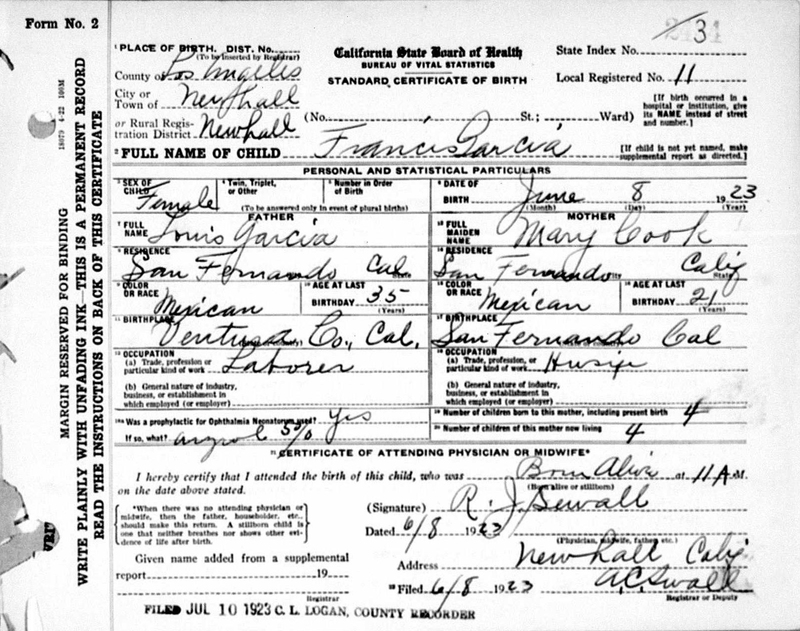 Birth certificate of Caroline Francis Garcia (as Francis Garcia), born in Newhall at 11 a.m. on Friday, June 8, 1923, to Louis and Mary Garcia. Mary Cook Garcia, who would become the matriarch of the Cooke and Garcia families, is the daugher of Fred S. and (Chief) Frances Cooke. Frances Cooke (Caroline's maternal grandmother) descends from individuals living in the Tataviam Indian village of Chaguayabit (Tsawayung) at Castaic Junction prior to European contact in 1769. Fred S. Cooke's paternal grandmother was a California Indian born at the Mission San Gabriel. Caroline is identified here as Mary's fourth child. We know less about the heritage of Caroline's father, Louis Garcia, but his 1919 marriage certificate lists his race as "white" and says both of his parents, Epidion Garcia and Carolin Ochoga (Garcia), were born in California. The certificate identifies the attending physician as R.J. Sewall. We don't know who that is. Coincidentally(? ), the deputy registrar who probably filled out the certificate was A.C. Swall. We know who that is. In 1923, Albert Swall was the local general merchant, hotelier, postmaster and pretty much everything else in Newhall. Just months before Caroline's birth, Albert Swall started and served as the first president of the Newhall Chamber of Commerce. TLP2301: 19200 dpi jpeg courtesy of Tricia Lemon Putnam.